For Brenda, her family and friends who loved her, and those of us who will not have the opportunity to know her better. Oops, forgot to post this yesterday! 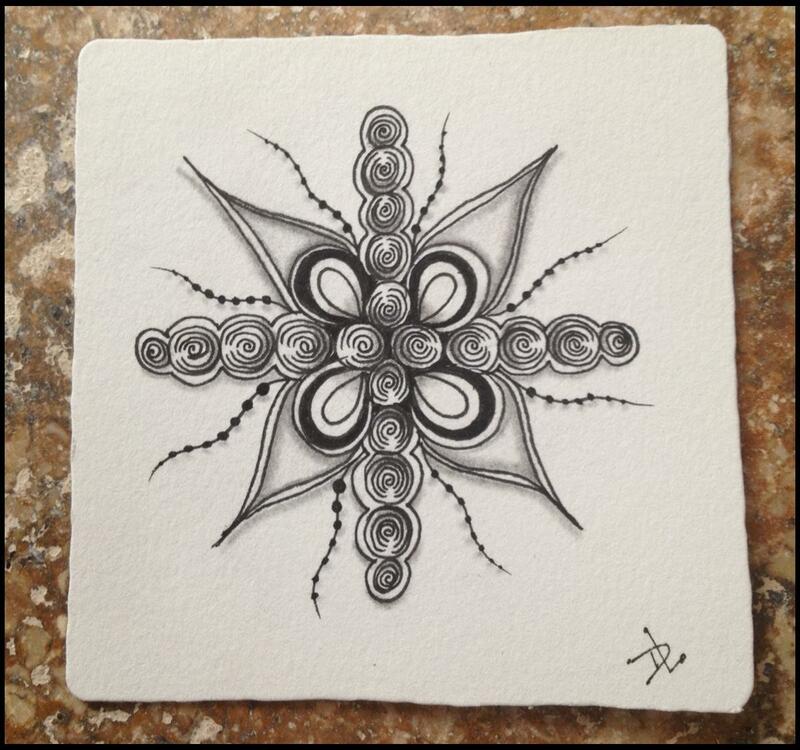 Resting a sore thumb today....here is an undated tile...probably circa Summer 2012. :0) Enjoy! 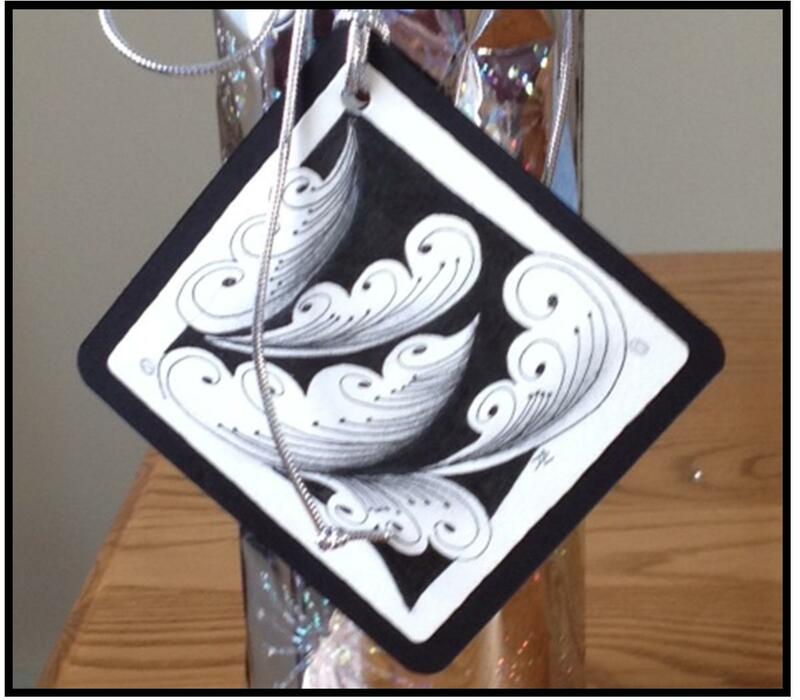 It was a fun morning at the Contoocook Farmer's Market. 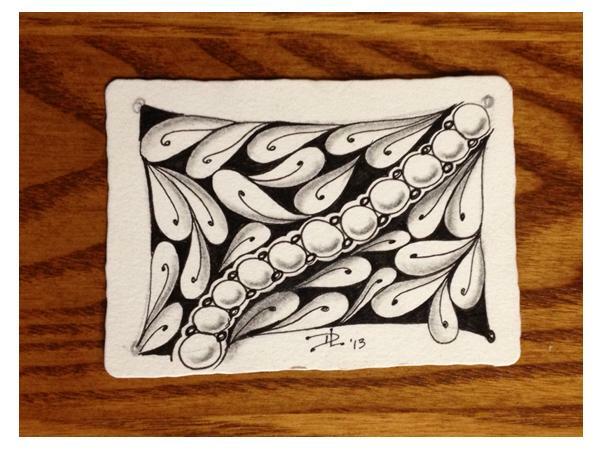 Here is the tangle I drew at the easel and raffled off. 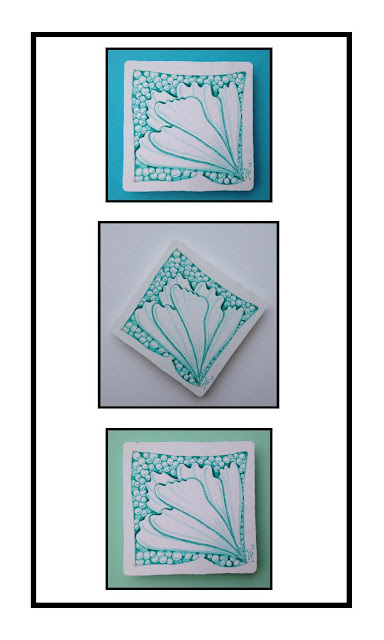 Today's tile was actually a scrap of card stock upon which I had been playing with the pattern "Diva Dance" some weeks ago. It has been pushed around on my desk all this time and it caught my eye this afternoon. I thought, "Why not!?" 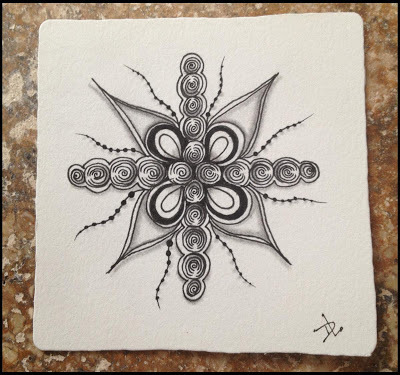 First tracing the outline of an actual Zentangle tile around the swirls I had drawn, I continued to work backwards adding the dots and frame. Then it was time to move forward and I completed the pattern and then quickly decided black blobs would be something fun to try. It then occurred to me to blend the smaller black blobs along the outer edge of the "diva dance" into the blob border, to make it "flow." Shading and highlighting finished it. "Different for me," was my husband's comment. 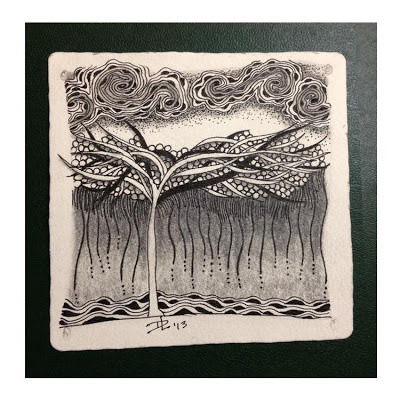 Today, a Zentangle ATC (Artist Trading Card) size tile. Keeping it simple with Onomato and a tangellation of Ennies? It is what it is! I am not all that confident with color and I don't find it relaxing. This tile started off with my taking as little control as possible. I flipped open my pattern binder. The first pattern I laid my eyes on was "cyme." I ran with it. 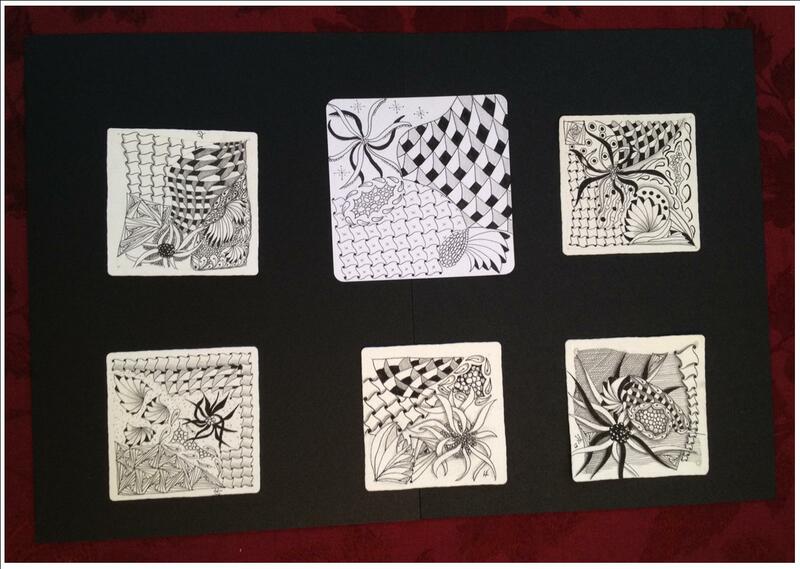 The proportion of the middle design was not to my liking, so I worked along the border. Not all tiles we draw fascinate us and that was the case here. 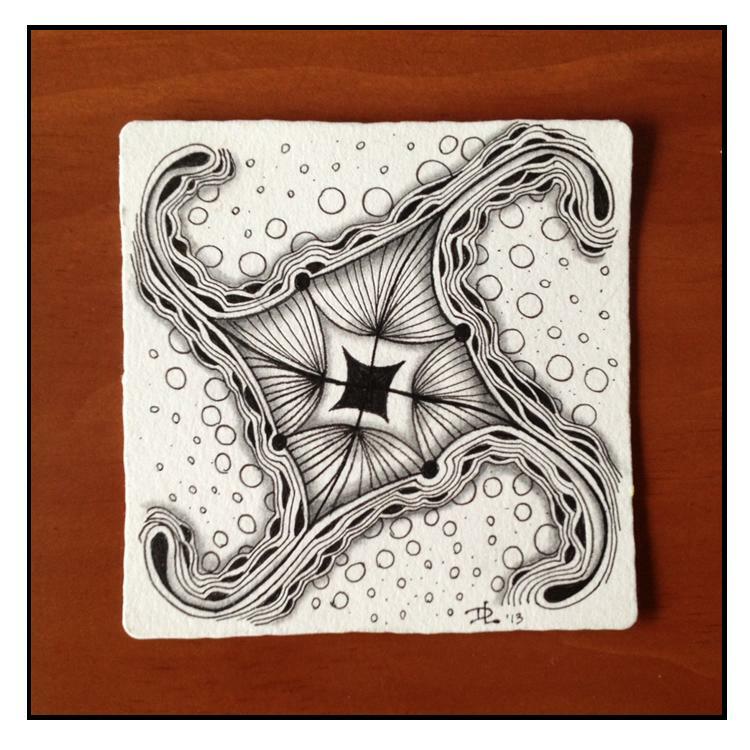 To make something of the journey, I decided to sacrifice this tile to a color experiment. Zentangle tiles do not like water, but I did find some success in moving around the Derwent water colors with a damp shading stump. This may require further experimentation - I haven't decided. All in all, the journey through this tile provoked a number of thoughts, and sometimes discovering what you don't want to do can be valuable. 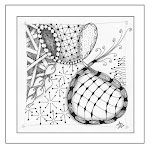 :o) Happy Tangling! 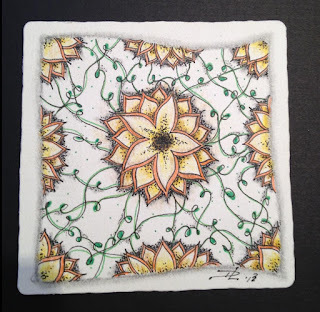 This tile was completed in three sessions today. One wonderful aspect of drawing a Zentangle is that you can do it in snatches of time, easily picking up where you left off or coming back to it with new perspective, each time enjoying the meditative benefits. This tile started with a simple string of three parallel lines. 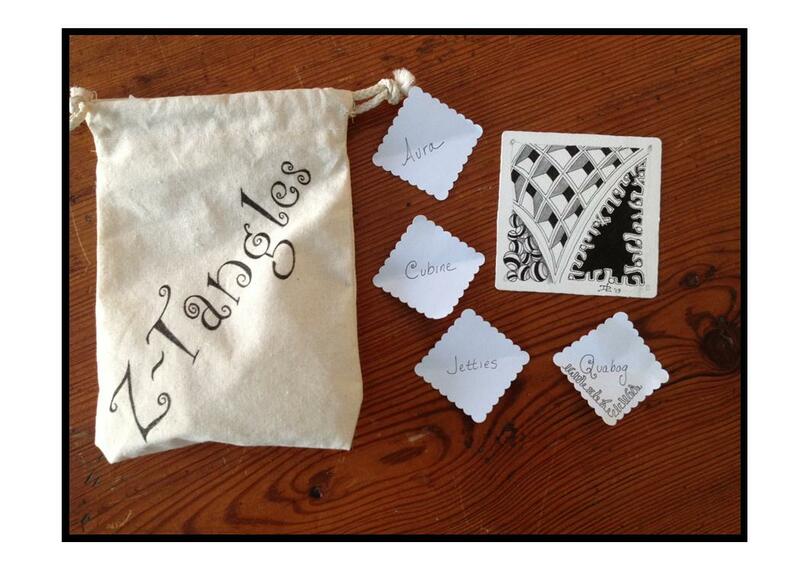 Patterns were selected at random, nothing predetermined. I also wanted to try my new Sakura Koi Coloring Brush pens, so there is some shading done with pen and some with pencil. 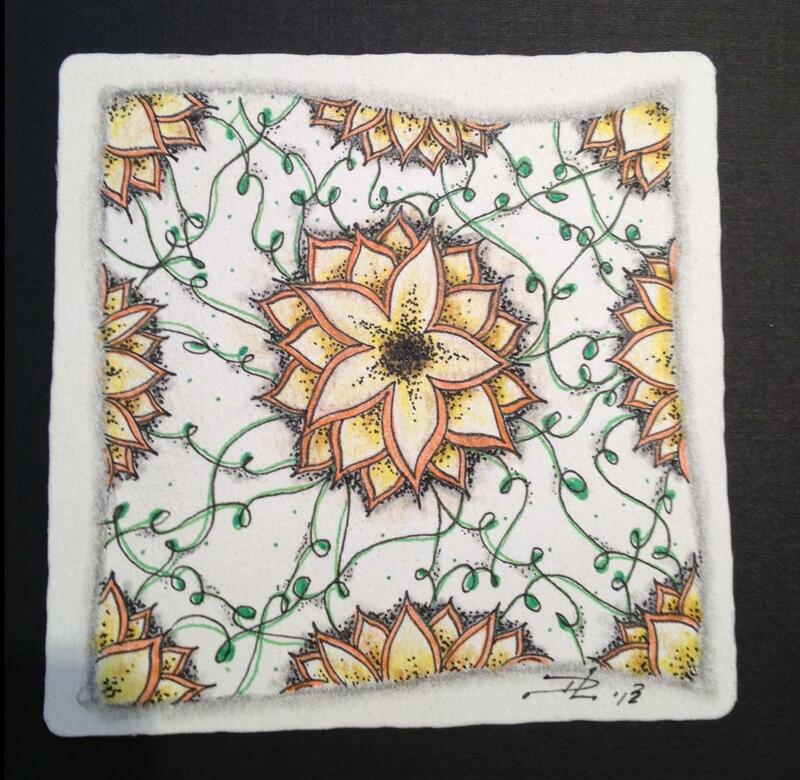 This tile was also shaded using a pencil and the tip of my finger to soften the shade. If you have always used a shading tool, try going without. 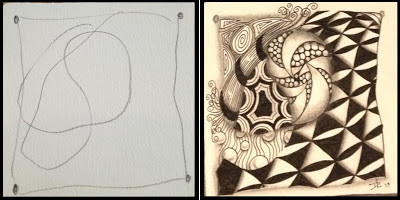 The shading is less controlled and broader in area, but there is a softness achieved with the finger tip that can not be had when using a shading tool. Enjoy! I hope you all had a Happy 2013 celebration, quiet or otherwise! 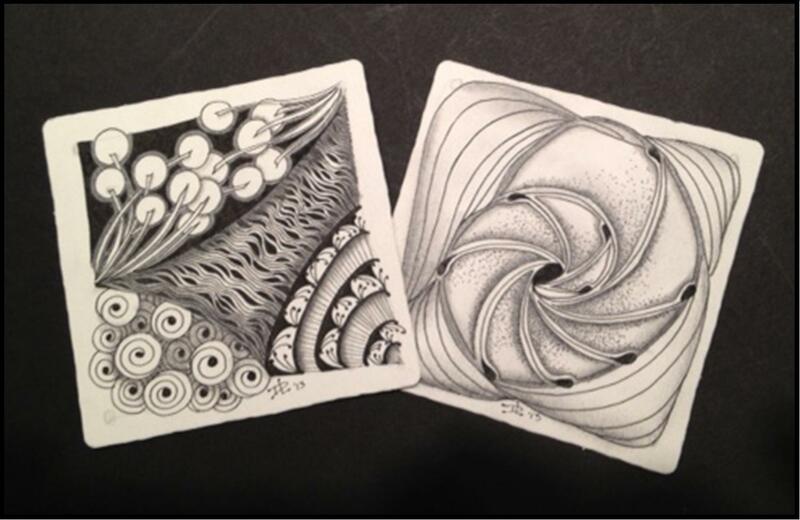 It is going to be a great year for tangling! Here is my first tangle of the year, which I have already given away. 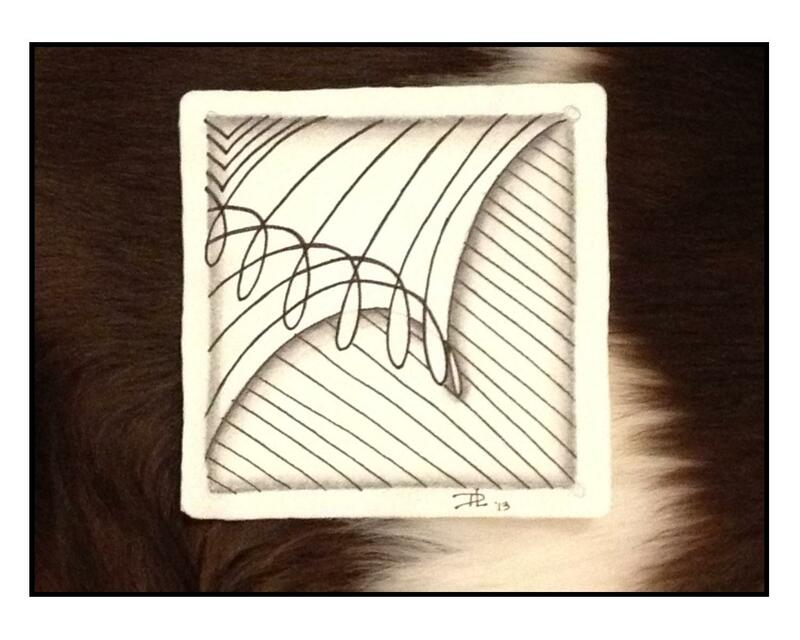 My only resolution this year is to attempt to draw a tangle a day and share them here as often as possible. 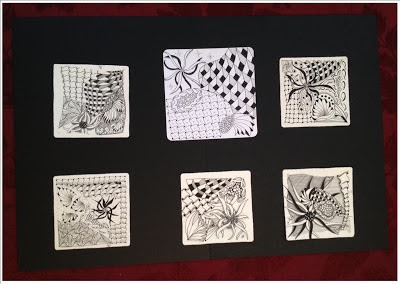 Look for my winter class schedule to be posted here later today, along with today's tangle. To all my students, I will be sending out the promised survey regarding special workshops for this winter.